The Kentucky Valley Educational Cooperative (KVEC) is a public education agency governed by superintendents from the counties of Breathitt, Floyd, Harlan, Johnson, Knott, Lee, Leslie, Letcher, Magoffin, Owsley, Perry, Pike, and Wolfe along with independent districts in Hazard (Perry County), Jackson (Breathitt County), Jenkins (Letcher County), Middlesboro (Bell County), Pikeville (Pike County), and Paintsville (Johnson County). These rural public school districts lie within the Central Appalachian Region of Kentucky and comprise an area about the size of Connecticut.  East Kentucky Superintendents realized the necessity of such an organization in the early 1970’s and KVEC was formed in 1970 to address the needs of rural school districts. The Cooperative serves as a regional public education entity, focusing attention on teaching, learning and leadership, maximizing educational opportunities, and contributing to a more effective use of resources.